In which I drop the famous names I saw this weekend. 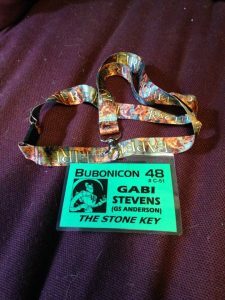 This past weekend I attended Bubonicon. Bubonicon is exactly what it sounds like—the local SF/Fantasy con here in Albuquerque named after something New Mexico is famous for—the bubonic plague (we still have it fairly regularly here). I was honored to be on three panels and participate in the massive book signing they have. I always give away my books for NM tax reasons, unless someone has already bought my books at a bookstore (on site, so it’s easy to buy). First let me just say it’s always nice to speak to and answer questions from people interested in my work—even if they come to hear someone way more famous than I. I was on a panel on Villains with SM Stirling, Caroline Spector, Joe Lansdale and Andy Kuhn. I love writing villains (which I’ve posted about here), and it listening and adding to the conversation showed me a few things as well. By the way, for me the most interesting book with villains is Agatha Christie’s And Then There Were None. Read it and find out why. I then was on a panel on self-publishing and sat next to Rachel Caine (!). The panel also featured Emily Mah, Pari Noskin, Robert Vardeman, and David Summers. An interesting give-and-take here. My biggest take is that I have absolutely failed in creating a newsletter and email list, mostly because I hate those things myself so I don’t want to subject anyone else to them. Besides, I’m not so interesting. The last panel I was on was called Good Writing: I Know What I Like. We spoke about what makes a story, what makes them good, and what our processes comprise. Big names here: Stephen Donaldson, John Maddox Roberts, Ben Bova, and Pari again. My big name drop of the weekend though has to be that I stood in a conversation circle with Connie Willis, Melinda Snodgrass, Jeffe Kennedy, and Darynda Jones, and we were joined by George RR Martin (It pays to be friends with Darynda). Not that I said a word (I’ve also posted about my shyness here). He likes to laugh. I like that in a person. And he wouldn’t recognize me again. Not only did I not say a word, I had forgotten my name tag at home so nobody had a clue who I was. The name tag I forgot with the cool lanyard donated by Rachel Caine. But the absolutely highlights of my weekend were two tiny incidents. The first was Pari Noskin, who came up to me and said that she was so happy to be on panels with me because she loves my work and respects me so much. What an absolutely beautiful thing to say and I don’t think I can even express how much those words meant to me especially coming from a colleague. The second was at the book signing. A couple came up to me, having bought my book, and they told me that my words on the panel on writing helped them so much, and they thanked me for appearing. They had gone out to buy THE WISH LIST, which I gladly signed for them, but I also gave them a copy of THE STONE KEY. To have total strangers admire oneself is such a joy. So that was my name-dropping weekend. No, I can’t tell you when George will be finished with his series. …Not. Okay mornings are beautiful, but that doesn’t mean I like them. Tell me this night view isn’t lovely. I dare you. If I had my druthers, I would stay up until 2:00 AM or later and then wake up accordingly. But the world doesn’t work that way, and I am a lone, insignificant individual who has no power to change it, so wake I must. Crueler still is that I must drive The Youngest to work and her shifts often start at 6:00AM. This morning for example. As I was driving home from dropping her off, I noticed how many people were up taking advantage of the cool air. They were jogging, strolling, or walking their dogs. Good God. Even my dogs aren’t morning people. When I left the house, they were both still sleeping in their spots. Worse, my mother is an early riser. I don’t care how old you are, your mother can do a guilt trip better than anyone, and she is firmly of the belief that anyone who sleeps in is lazy. I’ve tried to explain (since I was a teenager) that I work or do things into the night, so I’m not sleeping more than the early birds; my schedule has just shifted, but she doesn’t accept that. So as long as the world insists that mornings are superior to the rest of the day, I will rise and grumble (as opposed to shine).